Boiler treatment chemicals maintain clean boiler tube surfaces and minimize corrosion, thus reducing the chances of overheating or failure. Corrosion and deposition control helps increase plant reliability and availability, protects equipment, and reduces maintenance and fuel costs. In addition to controlling deposition and reducing corrosion, some water treatment chemicals can reduce the tendency for boiler water to carry over to the steam. This protects super heaters and steam turbines from potential damage. ACUTHERM 3100 is a high performance liquid catalysed sodium bisulphite based oxygen scavenger designed to scavenge oxygen and hence inhibit oxidative pitting corrosion within steam boilers. ACUTHERM 3100 is scientifically formulated to provide outstanding protection from oxygen corrosion. ACUTHERM 3100 will efficiently scavenge oxygen and hence inhibit oxidative pitting corrosion within steam boilers. 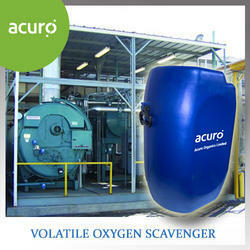 High performance oxygen scavenger giving outstanding protection from oxygen corrosion. Excellent inhibition of oxidative pitting corrosion. 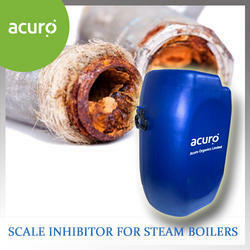 ACURO's boiler descaling chemical is a powerful liquid preparation that is capable of dissolving the most stubborn industrial scale deposits without affecting the metal. It contains unique inhibiting chemical constituents that prevent the acid’s attack on the metal surface, ensuring minimum metal loss. 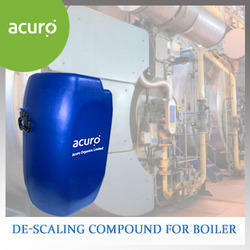 ACURO's descaling compound's cleaning method ensures that there is minimum plant dismantling. Thus the cleaning process becomes non-disruptive and turnaround time is fast. ACUTHERM 3005 is a high performance boiler water alkalinity builder scientifically formulated to maintain boiler feed water pH and alkalinity within a recommended operating range. 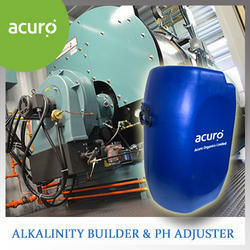 ACUTHERM 3005 aids the control of feed water pH and boiler system alkalinity. 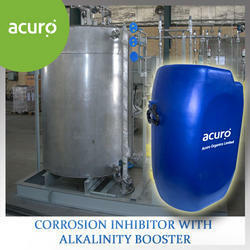 High performance boiler water alkalinity builder. 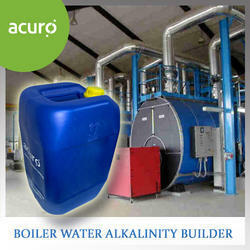 Offers excellent boiler feed water pH control. ACUTHERM 3006 is a high quality, very concentrated solution of sodium hydroxide 20-50% in water. ACUTHERM 3006 is one of the most concentrated sodium hydroxide based alkalinity builders available in our range and is used for controlling / increasing the pH or alkalinity of water in boilers, cooling systems and effluent streams. Specific applications for ACUTHERM 3006 include imparting hydroxide alkalinity to boiler feed water and neutralising acidity in cooling systems and effluents. Highly concentrated product making it very cost effective in use. A liquid product that allows easy and accurate dosing. ACUTHERM 3222 is a concentrated “combination cycle” scale inhibitor treatment system for steam boilers. It is designed to provide protection from scaling in all types of steam boilers operating at pressures up to 850 psig where feedwater hardness is low to high. ADVANTAGES: ACUTHERM 3222 is a proprietary “combination cycle” scale inhibitor for boilers. It is very effective in controlling boiler scaling and fouling. It can also provide “on line” clean up of carbonate scale, iron and other mineral deposits in the boiler drum, tubes and heat exchanger surfaces. AmGuard 4350™ is a special blend of organics, dispersant, polymers and crystal modifiers. With proper usage, it will inhibit scale formation by chelating undesirable metal ions such as calcium, magnesium, iron and copper, preventing their dep. 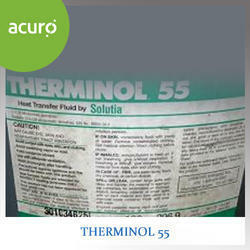 THERMINOL 55 is a synthetic heat transfer fluid used from -25C to 315C applications. It delivers a number of important performance benefits: long service life, good oxidation resistance, superb low temperature pumpability. CAS Number: 497-18-7Appearance: White Crystalline PowderAssay: 98.0% minOdour: Odourless.Water : 0.5% maxSpecific Gravity: 1.0200g/cm3.Melting point: 153 C minWater : 0.5% maxMolecular weight: 90.09Moisture: 0.2 MaxUse:It can be used as an oxygen scavenger to prevent corrosion especially in boiler feed system, a rocket propellant components, color images and the quality of soap stabilizers, antioxidants rubber, boiler water deoxidants and metal passivation agents, it also used as an intermediate for orgnic synthesis. 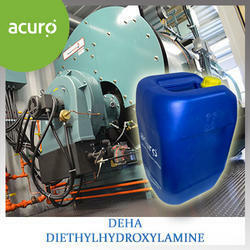 Diethylhydroxylamine (DEHA) has been utilized as an oxygen scavenger in boiler systems in many industries for the past 20 years. Its unique combination of properties, such as volatility; the ability to passivate steel surfaces; and its very low toxicity makes it the oxygen scavenger of choice for many applications. Deha Performance Characteristics DEHA has a number of beneficial properties as an oxygen scavenger in boiler feedwater ystems: 1. Rapid complete oxygen removal under typical boiler feedwater temperature and pH conditions. 2. 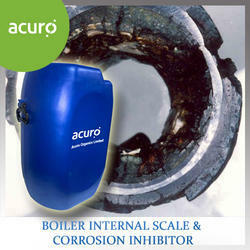 Promotes passivation of internal surfaces in the boiler system. 3. It is volatile similar to a neutralizing amine with the ability to distilled off the boiler, and is available to protect the entire steam condensate system as well as the feedwater and boiler system. 4. Under the action of heat, some of the DEHA is degraded to yield two neutralizing amines which assist in elevating the pH in the condensate. 5. 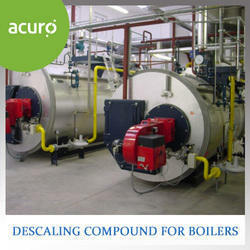 It has very low toxicity making it safe and easy to handle in typical boiler application systems. 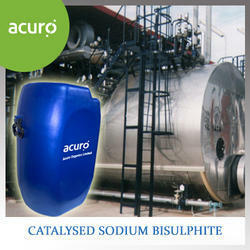 Oxygen Scavengers are required to prevent corrosion by oxygen in boilers and in oil drilling.Catalyzed Sodium Sulphite has enhanced reactivity with Oxygen at lower temperatures and pressure Catalyzed Sodium Sulphite is the least expensive and most active scavenger for boilers upto 600 psig.Also it is used for Oxygen removal from water used in boilers, oil well flooding, oil well drilling muds and other water uses where it is important to remove oxygen to reduce corrosion. Appearance: White granular crystals or powder. ACUTHERM 3223 is a concentrated “combination cycle” scale and corrosion inhibitor for steam boilers. ACUTHERM 3223 is designed to provide protection in all types of boilers operating at up to 650 psig where feedwater hardness may be low or high. ADVANTAGES: ACUTHERM 3223 is very effective in controlling boiler oxygen pitting, corrosion and boiler scaling and fouling. It provides “on line” cleaning of carbonate scale and will disperse iron and other foulants in the boiler drum. ACUTHERM 3223 is a proprietary “combination cycle” boiler treatment. ACUTHERM 3223 contains a special blend of organic phosphorous compounds, polymeric scale inhibitors, dispersants, chelants, alkalinity builders, and oxygen scavengers in a single, easily applied product. ACUTHERM 3223 offers much greater flexibility in dosing without over-treatment or under-treatment of a boiler system when compared to a typical phosphate cycle treatment program. This makes it a much easier program to control, requiring significantly less testing. 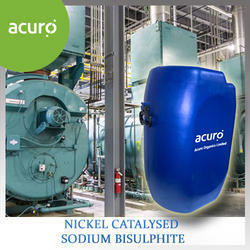 ACUTHERM 3200 is a high performance; liquid boiler treatment scientifically formulated using nickel catalysed sodium bisulphite and developed as an oxygen scavenger for the treatment of steam boilers and boiler water systems. ACUTHERM 3200 is a non-volatile, inorganic oxygen scavenger, which can be used in systems operating at pressures up to 65 barg. It contains 23% sodium bisulphite. ACUTHERM 3200 begins to break down at pressures of 43 barg and is completely decomposed at pressures above 65 barg. ACUTHERM 3200 prevents corrosion in boiler and other water systems by reacting with any dissolved oxygen in the water. Because of the nickel catalyst contained in this boiler treatment product the rate of reaction with oxygen is greatly increased, so that the oxygen is removed before it can begin to corrode metal surfaces. ACUTHERM 3200 may also be used for the removal of chlorine. ACUTHERM 3201 is a high performance, low toxicity volatile oxygen scavenger scientifically formulated for the treatment of steam boiler systems, steam raising plant and hot water systems. Accepta 2561 contains DEHA. ACUTHERM 3201 removes dissolved oxygen from the feed water, boiler water and condensate lines and can be used in medium pressure hot water (MPHW) systems and steam raising plant. ACUTHERM 3201 works to protect all the bolier system from oxygen pitting corrosion. It passivates iron and copper surfaces through the formation of protective oxide layers. ACUTHERM 3201 does not contribute to boiler TDS.ACUTHERM 3201 contains DEHA. ACUTHERM 3004 is one of the most concentrated sodium hydroxide based alkalinity builders/pH adjusters available for the treatment and control of pH in boilers, cooling systems and effluent applications. ACUTHERM 3004 is used for increasing/controlling the pH or alkalinity of water and effluent streams. Specific product applications for ACUTHERM 3004 include imparting hydroxide alkalinity to boiler feed water and neutralising acidity in cooling systems and effluents. 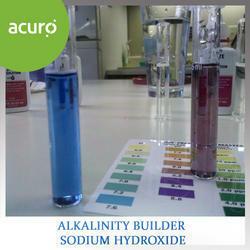 Superior quality alkalinitybuilder / pH adjuster for boilerfeed water applications. Ideal for neutralising acidity in coolingsystems and effluents. Cost effective, highly concentrated product. Liquid product, easy and accurate dosing. ACUTHERM 3220 is a concentrated “phosphate cycle” scale inhibitor, polymeric dispersant and sludge conditioner for steam boilers. It is designed for use in all types of steam boilers operating at pressures up to 850 psig where feedwater hardness does not exceed 10 ppm. ADVANTAGES: ACUTHERM 3220 is proprietary “phosphate cycle” scale inhibitor for boilers. 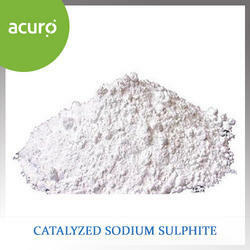 It is very effective in controlling calcium carbonate scale, as well as its dispersion of iron and other foulants. ACUTHERM 3220 is a proprietary blend of complex phosphates, polymeric scale inhibitors, dispersants, and sludge conditioners in a single easily applied product. ACUTHERM 3300 is a high performance, all-in-one boiler water treatment based on organic tannin with built in alkalinity booster. ACUTHERM 3300 is an excellent corrosion and scale inhibitor scientifically formulated using hydrolysable tannin as an oxygen scavenger plus built in alkalinity booster. ACUTHERM 3300 is designed for the treatment of small boilers. High performance all-in-one water treatment formulation for small boilers. Includes built in alkalinity booster. 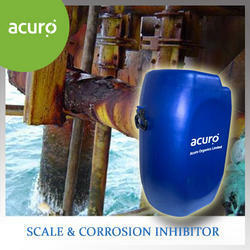 Offers excellent corrosion and scale inhibitor performance. ACUTHERM 3301 is a high performance, blended liquid boiler water treatment based on organic tannins, polymer sludge conditioners and alkali that is scientifically formulated for the treatment of steam boilers and low pressure hot water systems. ACUTHERM 3301 can be used with softened or moderately hard make-up, and in many instances provides a complete balanced treatment by itself. However it can be used with other widely used conjunctional treatments to provide phosphate control and condensate system protection. ACUTHERM 3301 controls corrosion by the dual mechanism of oxygen scavenging and the formationof a corrosion resistant tannate film. ACUTHERM 3301 prevents scale formation by converting residual hardness salts to a mobile non-adherent sludge that can be removed by blow-down. High performance multifunctional formulation for steam boilers and low temperature hot water systems. Ideal for softened or moderately hard make-up water. Excellent system protection by dual mechanism of oxygen scavenging and the formation of a corrosion resistant tannate film. ACUTHERM 3221 making preparations of concentrated phosphate and polymer antiscalant, and mud in the boiler system. Preparations are designed for use with most types of boiler working pressure up to 850 psi (58 kg / cm 2 , 58 bar) and boiler feed water hardness from low to high. ACUTHERM 3221 is a dedicated preparation and adhesion antiscalant for boiler. 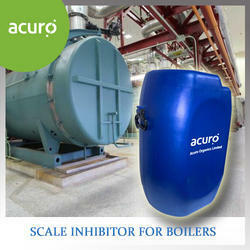 It is very effective in controlling congestion and scale boilers. It is also used as a cleaning preparations "online" for carbonate deposits, iron deposits and other adhesives in boilers, pipes and heat exchanger surfaces. ACUTHERM 3221 is a mixed preparations mixture of organic compounds, polymer antiscalant compounds, compounds and substances dispersed mud stick. 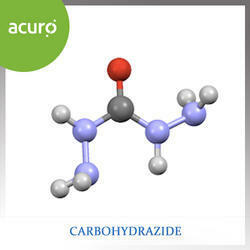 It can be used very flexibly in many different devices with different dosages. 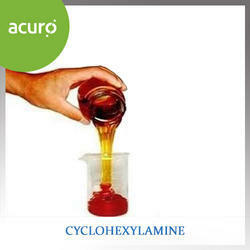 Cyclohexylamine is an organic compound. It is a colorless liquid, although like many amines, samples are often colored due to contaminants. It has a fishy odor and is miscible with water. Like other amines, it is a weak base, compared to strong bases such as NaOH, but it is a stronger base than its aromatic analog, aniline. It is a useful intermediate in the production of many other organic compounds. Physical state and appearance: Liquid. Color: Colorless to light yellow. Solubility: Easily soluble in cold water. ACUROCLEAN CX5 descalers eliminate limescale, calcium deposits, rust and more from HVAC and process manufacturing equipment. 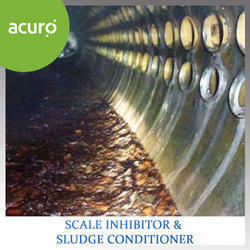 When optimum performance for your industrial plate and frame heat exchangers, heat exchangers tubes, evaporative coolers, HVAC cooling towers, boiler tubes or chiller tubes is needed, trust ACUROCLEAN CX5 industrial descaling chemicals and re-circulating systems to deliver top performance.ACUROCLEAN CX5 descaling solutions remove lime scale, remove calcium and remove rust, plus other water scale buildup, mud and other non-soluble deposits safely and effectively. Cleaning industrial heat exchangers tubes with ACUROCLEAN CX5 descaling systems and descaling chemicals improves efficiencies and helps your heat exchanger deliver top performance on critical applications. ScaleBreak industrial descaling liquid can be used in our descaling systems or directly in water cooling towers, evaporative coolers, boiler tubes, chillers, plate heat exchangers and much more. Looking for Boiler Chemicals ?